“Once we have clarified the higher roots, we will clarify the branches in this world. Know that a branch that extends from the internality is the people of Israel, which have been chosen as an operator of the general purpose and correction. It contains the preparation required for growing and developing until it moves the nations of the worlds, too, to achieve the common goal. “The role of the Israeli nation to qualify the world for a certain measure of purity, until they are worthy of taking upon themselves His work, no less than Israel were worthy at the time they received the Torah.”—Baal HaSulam, “The Arvut,” (Mutual Guarantee), Item 21. In the News (from End of the American Dream): “According to the New York Times, more than 30 million Americans are currently taking antidepressants. Americans account for about five percent of the global population, but we buy more than 50 percent of the pharmaceutical drugs. “The rate of antidepressant use among middle aged women is far higher than for the population as a whole. At this point, one out of every four women in their 40s and 50s is taking an antidepressant medication. “Americans also consume a whopping 80 percent of all prescription painkillers. “A survey conducted for the National Institute on Drug Abuse found that more than 15 percent of all U.S. high school seniors abuse prescription drugs. My Comment: As long as the drugs are bought with money, their consumption will only increase and Americans will be taught to use them. Question: You spoke about money as an obsolete unit of currency, and that society is heading towards the creation of a new currency that will be based on the strength of mutual cooperation between people. One of the greatest concerns related to money is the fear that there won’t be any. How can this new currency help a person to overcome fears of this kind? Answer: Fear doesn’t depend on the number of banknotes I possess. This is an internal, psychological phenomenon. A person always checks himself in relation to the environment, so he honestly believes that with a large amount of money covering him, he will feel more secure and less afraid. For a large part of the world’s population it would be helpful if they could be released from this fear, with what is called a basket of goods necessary for living. And people would pay for all of the products that go into this basket, as is done now with health insurance and pensions. It could be that it will be possible to solve part of this question at the expense of those whose income is above average. But this action must be accompanied by an explanation to and education of the population. Comment: Until now a person truly thought of money as a motivating force. Whereas now we are speaking about a new resource, which we apparently ignored and didn’t taken into account. Answer: We always celebrate important events while we gather around a table. Here a person apparently generally gets respect. This is not just the generosity of the rich strata to the poor, rather it is an act of connection, with the participation of everyone. In this way we raise people to another level of understanding: How do we attain a life where money belongs to everyone and doesn’t belong to anyone individually? On the other hand, this activity must itself be carried out cooperatively. I would absolutely put the reception of a basket of necessities as a condition for participation in integral education, lectures, and workshops. All of our fears are derived from comparing ourselves with others. But if I am in the same situation as everyone else, then even in the worst of times, I can feel good about myself. In addition to this and through connection, we are ready to discover additional sources of power that are derived from the connection itself, the combining of opposites, and those that may be at a distance. We can find new wealth that we didn’t know existed. By representing this educational program to the people, as a result, we receive positive energy and the ability to influence even the most indifferent strata of the population. As a result, they will also be compelled to change. Therefore, successful steps to popularize the idea about a consumer basket of necessities will serve as a key for general change within the entire nation. Question: What does a strong family, a strong home, mean for a Kabbalist? Answer: A strong family is a family that lives in a strong environment, and since an environment like this is good for them, this is a strong home for them. A home is a human environment, not the stone walls or physical structure. Nowadays, the concept of a home has gradually changed its meaning, and it is understood that stone walls no longer can protect us from anything whatsoever and don’t provide any sense of security. This is because security is found in the good relationships and incorporation into all the circles of human society. Today society is the next circle for a strong family home, and for society, a wider circle is the nation, and so on. This means that the concept of a home as a cave, tent, tabernacle, apartments, etc., no longer exists. A home is about going out to establish interpersonal connection. So here all of the physical borders have been destroyed and only internal contact between people remains. Walls, seas, and oceans cannot separate us, as we must be connected. The development of the Internet clearly shows this to us. Question: Can Europe, which opened the borders between the nations of the European Union, serve as an example for us? Answer: Unfortunately, Europe took this step from the point of view of egoistic benefit for itself, to make more money, avoid war, and exploit the weaker nations. The nations of the European Union connected only the banks. In their program, the integration of all of humanity and the mutual penetration of cultures with each other did not enter into the plan. Only today are they beginning to understand how far they are from integration. Question: In Israel Arabs are rioting. Are all of our efforts around the world don’t help? Answer: I know only one thing; everything that happens is a result of our efforts. If the efforts are successful, one thing will happen; if they are less successful, something else will happen. We are the only ones who determine what will happen to the nations of the world abroad and with our neighbors here. Everything is determined by the efforts that the people of Israel must make. Are they investing them? This is the problem. According to what is happening, we really haven’t been ready to direct events in the right way so that it will be good both for us and our neighbors. One way or another, we determine this and nobody else. It isn’t Nasrallah, Ahmadinejad, Rohani, or Abu-Mazen. Why do we ascribe any actions to them? There isn’t and there won’t be anything from their side. Everything depends on you, you are the only one in the world who has freedom of choice. You determine everything that Israel encounters internally or externally. It is as if you are sitting in some machine and are running it. And nothing more. We are always drawn to hear the news: what is happening in our country and abroad, what are the world leaders doing. But everything depends on you, so why should you know about them? You need the news about which groups connected, which events happened, where we distributed materials, how many threads we have passed between Jews through television and the Internet so that they also will understand that everything depends upon them. This is what you need to know. This is the real news. After all, they don’t determine what will happen either today and tomorrow, nothing. And so, when you are horrified about the Arab riots, know that you have a part in them. Comment: The problems of Israel are not only the Arab riots. There is also corruption. Answer: I am not talking only about security, but also about the economy, politics, health, and more. You alone determine everything, including all the phenomena of nature: the still, vegetative, animate, and human. Who are you? You are the people of Israel. Regarding corruption, you haven’t only involved in it, but have also awakened it. You have implemented the model of corruption in its root, and after that, someone realized it by traditional means. Question: What must I do today to remove all the faults that I see in front of me? Answer: Everything depends on you. You can build a wonderful life that will bring the Light that Reforms to the world. Do you want a good world that will return you to the good? This is what the Light does. So, attract the Light that will turn everything towards the good. Only you can do this, together with your friends. Organize a strong event and connect, consolidate a shared idea, reach a common decision, do something. You are ready. Otherwise, neither you nor we will discover the power of evil that we feel today. If we feel its influence, it is designed to arouse us. And this testifies to our lack of work and our lack of precise correspondence to this force. In other words, everything is simple. If there are riots in Israel, this means that we are constantly deteriorating backward. We have not completed our part, but instead, the opposite. The process demands much greater advancement, agility, and acceleration from us, and, on the contrary, we have slowed down. Otherwise, would we have discovered the problems as they are today? Many thanks to my student Kris Dawson. 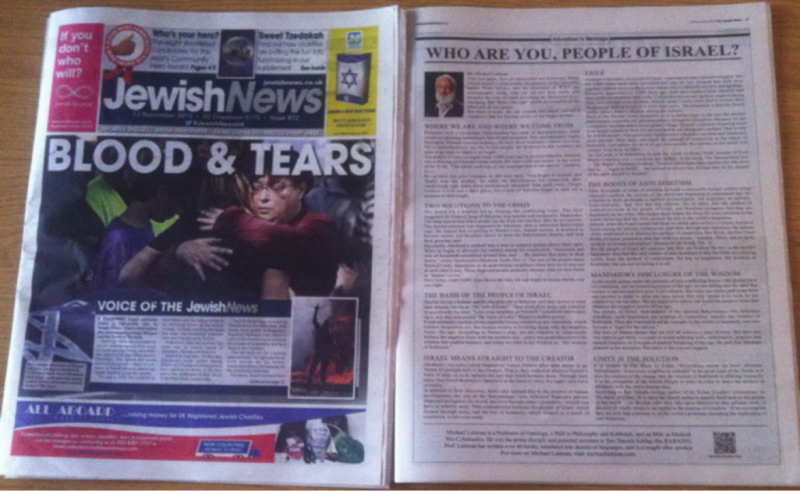 Thanks to his efforts my article published in The New York Times was reprinted in the newspaper Jewish News, Britain’s largest Jewish newspaper.